Hitting a ball just once is not enough for Hunter Pence. How about hitting a single pitch three times? San Francisco Giants outfielder Hunter Pence comes from a world I don’t understand. No, not the National League. When he was traded to the Giants this summer, I quickly realized that Hunter Pence is from another planet … where the energy is so plentiful and so intense that its inhabitants need no Starbucks or Monster drinks to thrive. In fact, a double espresso or a Red Bull would likely cause spontaneous combustion. Hunter Pence is like a pinball in a machine gone crazy. When Hunter Pence swings at a baseball he doesn’t really swing. He slashes, chops, sweeps, hacks, oh hell, just make up a word … ok, he scaswables at the baseball. Over and over and over. He swings like he’s been covered in cobwebs. He swings and swings and swings. He drops to one knee as he swings. He spins himself around. He swings at the air as though the air has done something to irritate him. He is crazy mad at the air. Just go over to YouTube and search “Hunter Pence warm up swing” and you’ll see things like this. So was it any surprise that Hunter Pence hit a single pitch not once, not twice, but three times with a single swing of the bat last night? No, not crazy by Hunter Pence standards. But, what was crazy is that the bat broke as it hit-hit-hit the ball, and the ball still went fair. It was a hit. A hit that drove in three runs. If the St. Louis Cardinals had a sinking feeling about last night’s Game 7 last chance, it had to come with that single improbable, impossible, insane swing of the bat. But, you probably ought to see the entire thing unfold in real time. And, you can do that here. Well, thanks to my Husband/Editor who — as a joke, I think — got me a baseball rule book, I can tell you that there is, in fact, a rule for just this sort of Hunter Pence insanity. I turn your attention to Rule 6.05 (h) in the “comment” section. So, yeh, hit the ball as many times as you like, Hunter. 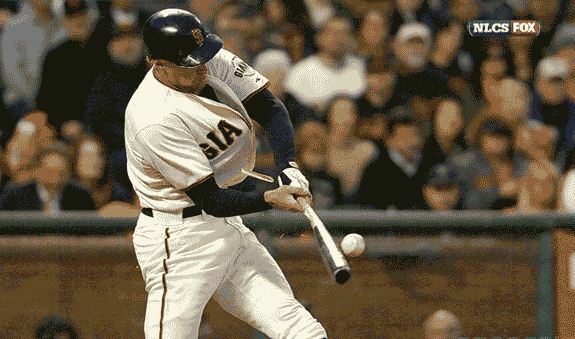 In fact, the rulemakers also allow you to hit the ball with your bat and then with your batting helmet and still be fair. So you see, the rulemakers were trying to come up with every potential Hunter Pence at bat that they could in formulating this comment section. With an at-bat like that, which resulted in 3 runs, well, you know the Giants were going to win. And so, 9-0 later, they did. And, the Giants go to the World Series. By the way, I bleed Orange & Black … and that is for the Baltimore Orioles … the team that taught me what baseball is all about. The Orioles are MY team. But, there’s a little orange and black that I save on the side for the Giants. My dad was really more into basketball and football. But, he enjoyed some good times in L.A. and so, if baseball was his only option, then a Dodgers fan he was. It seemed only fair, to us anyway, that I cheer for the Dodgers’ rival. A little Giants fan was born. And, so I guess I have some World Series games to watch. This entry was posted in Baseball and tagged Baseball Rules, Hunter Pence, Post-Season, SF Giants, St. Louis Cardinals, World Series by Jackie, The Baseball Bloggess. Bookmark the permalink.